The materials found on the Web Site are protected by United States and other copyright laws, except for works of the United States Government pursuant to 1 U.S.C. Section 105. The selection, arrangement and presentation of all materials (including information in the public domain), and the overall design of the Web Site are copyright (c) November 2, 2009, Sakura Silk, Inc. 8447 Wilshire Blvd., #401, Beverly Hills, CA 90211. Permission is granted to view and print materials from SakuraSilk for the non-commercial purpose of viewing, reading and retaining for reference. 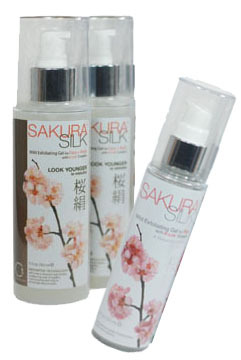 Any other copying, distribution, retransmission or modification of information or materials on this site, whether in electronic or hard copy form, without the express prior written permission of Sakura Silk, Inc 9171 Wilshire Blvd., Suite 500 PMB 152 Beverly Hills, CA 90210 , is strictly prohibited. SakuraSilk (is/are) trademarks or service marks of Sakura Silk, Inc 9171 Wilshire Blvd., Suite 500 PMB 152 Beverly Hills, CA 90210. SakuraSilk DOES NOT MAKE ANY EXPRESS OR IMPLIED WARRANTIES, REPRESENTATIONS OR ENDORSEMENTS WHATSOEVER (INCLUDING, WITHOUT LIMITATION, THE IMPLIED WARRANTIES OF MERCHANTABILITY OR FITNESS FOR A PARTICULAR PURPOSE) WITH REGARD TO THE WEB SITE, THE MATERIALS, ANY PRODUCTS, INFORMATION OR SERVICE PROVIDED THROUGH THE WEB SITE, OR ANY SITES LISTED THEREIN, AND THE WEB SITE WILL NOT BE LIABLE FOR ANY COST OR DAMAGE ARISING EITHER DIRECTLY OR INDIRECTLY FROM ANY SUCH TRANSACTION. 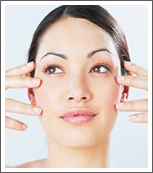 THE WEB SITE DOES NOT WARRANT THAT IT WILL BE UNINTERRUPTED OR ERROR-FREE OR THAT DEFECTS IN IT WILL BE CORRECTED. THE WEB SITE IS PROVIDED ON AN "AS IS, AS AVAILABLE" BASIS. IN NO EVENT WILL THE WEB SITE OR ITS MEMBERS, MANAGERS, OFFICERS, EMPLOYEES, AGENTS AND THE ASSIGNS OF SAME BE LIABLE FOR (1) ANY INCIDENTAL, CONSEQUENTIAL OR INDIRECT DAMAGES (INCLUDING, BUT NOT LIMITED TO, DAMAGES FOR LOSS OF PROFITS, BUSINESS INTERRUPTION, LOSS OF PROGRAMS OR INFORMATION, AND THE LIKE) ARISING OUT OF THE USE OF OR INABILITY TO USE THE WEB SITE, THE MATERIALS OR ANY INFORMATION, OR TRANSACTIONS PROVIDED ON THE WEB SITE OR DOWNLOADED FROM THE WEB SITE, EVEN IF THE WEB SITE OR ITS AUTHORIZED REPRESENTATIVES HAVE BEEN ADVISED OF THE POSSIBILITY OF SUCH DAMAGES, OR (2) ANY CLAIM ATTRIBUTABLE TO ERRORS, OMISSIONS OR OTHER INACCURACIES IN THE WEB SITE, THE MATERIALS AND/OR LISTINGS OR INFORMATION DOWNLOADED THROUGH THE WEB SITE. BECAUSE SOME STATES DO NOT ALLOW THE EXCLUSION OR LIMITATION OF LIABILITY FOR CONSEQUENTIAL OR INCIDENTAL DAMAGES, THE ABOVE LIMITATION MAY NOT APPLY TO YOU. IN SUCH STATES, THE WEB SITE'S LIABILITY IS LIMITED TO THE GREATEST EXTENT PERMITTED BY LAW. 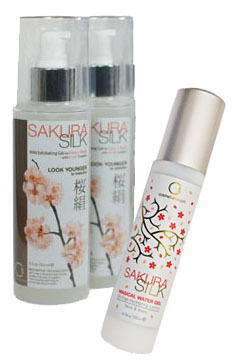 Questions or comments regarding the Web Site should be sent by e-mail to info(at)sakurasilk.com or by U.S. mail to Sakura Silk, Inc 9171 Wilshire Blvd., Suite 500 PMB 152 Beverly Hills, CA 90210.